Critical care nurses at Hull Royal Infirmary and Castle Hill Hospital are amongst the first in the region to undertake a new type of training course focused on the safe transfer of patients. Having identified a need to offer specific training for nursing staff in the movement of critically ill patients, our Critical Care Teacher Trainers Team ran a pilot version of their SCRIPT (Safe CRitical Ill Patient Transfer) course just a couple of weeks ago. Whether critical care patients are being transferred 100 yards for a CT scan or 100 miles to another hospital, the principles of care remain the same, and so the aim of the course is to ensure nursing staff can provide a safe, high quality and consistent level of care to everyone. SCRIPT is believed to be the first in the region to offer such practical, hands-on course content, using simulation mannequins to create lifelike scenarios, with support from the HILS Simulation Team. Thirteen critical care nurses from both hospital sites took part in the first training course under the direction of ICU Consultant, Dr James Pettit, Dr Gemma Lee, Specialty Doctor in Anaesthesia, Mandy Price, Critical Care Outreach Specialist Nurse, and Dr AB Wong, FY2 Academic Emergency Medicine. Following a morning of practical workshops, participants then moved on to the simulated transfer of a patient for CT scan in the afternoon. 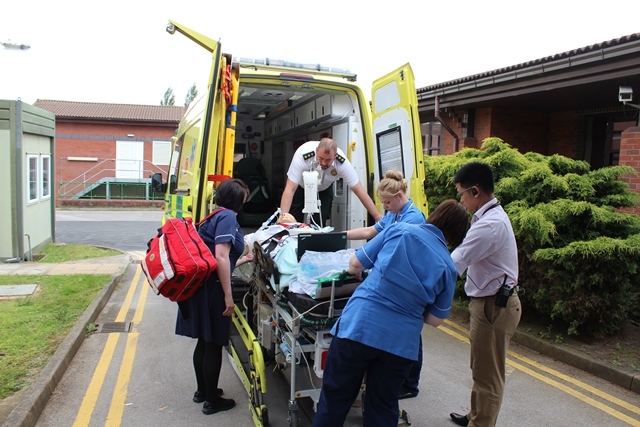 With the assistance of Tim Butterill from Yorkshire Ambulance Service, the nurses were also able to simulate the transfer of a patient from ward to ambulance, testing their skills and responses in a much smaller and more unfamiliar environment than they are used to. Each scenario was followed by a debrief covering what happened, any risks or communication issues which arose, how people felt during the exercise, and any lessons learned. “Training in the transfer of critically ill patients is given to medical ICU staff automatically, but this is not something we, or indeed many other Trusts, have previously been offering to our nurses. “The introduction of the SCRIPT course gives critical care nursing staff the chance to practice their skills in a safe and supportive environment. This doesn’t just equip them with the technical skills they need, but it also allows them to practice their communication skills and see how they work together in a pressurised situation. As a Trauma Centre, the Trust has a total of 44 critical care beds and around 170 critical care nurses, making the importance of transfer skills and experience all the more important. “The support we have had for this course has been overwhelming, and we’re grateful for Yorkshire Ambulance Service’s involvement as it’s rare to have an opportunity to train in an ambulance and to practice transfers with ambulance staff, who can bring a very different perspective.